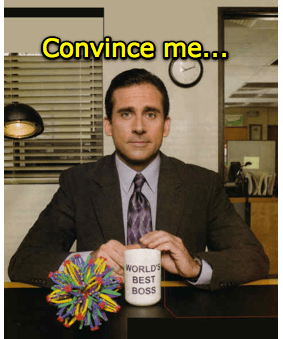 How to convince your CEO of Content Marketing? So you got convinced of Content Marketing or Inbound Marketing, but you have no clue how to convince your CEO of its value? This post describes a practical plan on how to do that. As a marketer, there is so much to take care of to drive the business forward. Not only do we need to create a brand, make sure our brand reaches our target audience through the best communication channels, we need to engage and interact with buyers, generate sales ready leads… the list is endless. Many of these marketing efforts cost money, which need to be defended towards the CEO or the management board of the company. Back in 2011, @BrennerMichael posted an article about how marketers have little credibility towards CEO’s. The post pulled numbers from a study reporting that 73% of CEO’s say marketers lack credibility due to an inability to translate the results of marketing campaigns into outcomes that improve business performance such as new demand, sales, customers, or market share. This is compounded by the study’s result that 69% of the marketers actually agree that they cannot translate the result of their marketing efforts into quantifiable business value. Solving this issue is another debate, but my point is that sometimes you do not have the CEO behind you. Do you believe in content marketing ? But if your are reading this post, it might just happen to be that you got so much convinced about content marketing or inbound marketing, like I did, because it touches the very foundations how we do marketing. And you believe that you should change the way your company is doing marketing in general. You believe that you finally found a way as marketing to grow the business and stand out, but more importantly, keep up with the changing world around us. So how do you go about in defending this major change? To make the challenge even bigger, not only you need to convince the CEO, you will need to convince many people within your company because you will need these people to execute your content strategy. Within marketing you might already realize for that you need to change your content and ‘think customer’, because your content is too much “product” oriented or “our company” oriented. But changing that is easier said than done. There are always other things to do, and marketing departments are so much activity or event driven, and filled with deadlines, that there is no time to implement these type of changes. Being aware of what you are doing wrong, start studying the domain of inbound marketing and content marketing, pull out as many examples and ideas as you possibly can, and write them down. Make sure the study material you pick out contains practical guidelines and how-to’s, that helps you immediately without having to translate the theory into practice. Create a comprehensive document (preferably a Word document) in which you explain where you are as a company today, explain the things you are doing wrong by using real examples from your business, and use examples that improve which are close to your business which you find in your research. I know of such a document which is more than 40 pages, which is ok. Send out the document to your CEO, CMO and CTO by explaining how extremely important this subject is to you, and that you truly encourage them to go through the complete document and give their comments. describe how you are “hiding content” behind registration forms, or not even publishing the content because you are afraid that your competitors might read it. But that you are also hiding this same content for your own customers. Describe how your new world should look like when you produce content for buyers, and how different that content will look. how all of this will affect your existing marketing efforts. If you do this right, I am 100% convinced you will get a reaction. What if your CEO’s doesn’t buy it ? To be honest, if you get limited reaction, the research you have done in content marketing and mixing inbound with outbound marketing will give you so many strong ideas which you CAN implement. And this without asking extra budget to your CEO. if you have come so far in reading this post, thank you. The nice thing about content marketing is that it does not have to have an impact on your budgets. When you study the domain, you’ll see that by shifting a limited amount of advertising budget or tradeshow budgets towards your content marketing initiatives, you can already do great things. Or even without shifting these budgets, your research bring in so many great ideas that you can implement immediately without great effort. So, will you sell this to your CEO? Go for it!